Meriame Berboucha is a Master of Research (M.Res.) 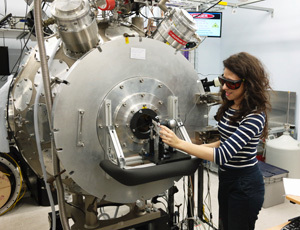 student at Imperial College in London, carrying out a project at SLAC National Accelerator Laboratory at Stanford, where she will be working on pulse characterisation for the LCLS-II upgrade. (The LCLS-II is the world’s first hard X-ray free-electron laser.) 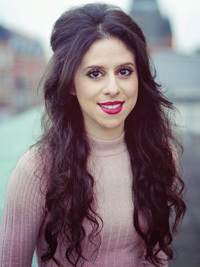 Prior to this, Meriame studied for her undergraduate degree in physics, also at Imperial College London, where she developed her passion for lasers and plasma physics. My first ever ambition in life was to become an artist, and then after that I wanted to be an athlete, then a medical doctor, then finally a medical physicist and now I want to be a laser engineer! Yes, I know, I’ve had a rollercoaster of career ambitions. I ended up writing my university application for a medical degree and then quickly changed my mind after a school trip my physics teacher took us on to the Rutherford Appleton Laboratory near Oxford, where we attended a talk on medical physics. For the first time, I saw the connection between being able to save lives, mathematics and physics and it was just the perfect combination for me because these were all the things that I loved in one subject! From there, I started my university application for physics and now I’ve just graduated with a physics degree from Imperial College London! I really never thought I’d do a subject like physics, but it was the only A-level subject where I felt like I was challenged, that I was curious to find out more and that I could make a change to the world around me. I found it fascinating and I loved maths, so being able to solve equations and plot graphs in experimental work was great fun. Since then, I’ve done numerous summer placements in experimental physics and I love developing my own experiments to answer questions that we don’t know the answer to. I’m a very hands-on person so, for me, experimental physics is essentially like playing with a shinier version of LEGO! I also work with lasers which are like my versions of light sabres. All in all, I love experimental physics and the fact that I get to ‘scientifically play’ in the lab every day is something I’m super grateful for. I’m currently doing a Masters in Research (M.Res.) in photonics, which is the study of all the processes related to light – for instance, light generation, detection and manipulation. As part of the M.Res., I have lecture courses which allow me to learn more about how lasers work, how we can make our own imaging systems with lenses and mirrors, as well as techniques we can use in experiments to take useful images of our experiments in order to find out the science of what is going on. Alongside lectures, I also carried out 20 short experiments which provided a really good grounding in experimental physics relating to photonics. I generally work with a lot of lasers, mirrors and lenses – it’s a lot of fun! This term I’ll be starting my M.Res. project at the SLAC National Accelerator Laboratory. 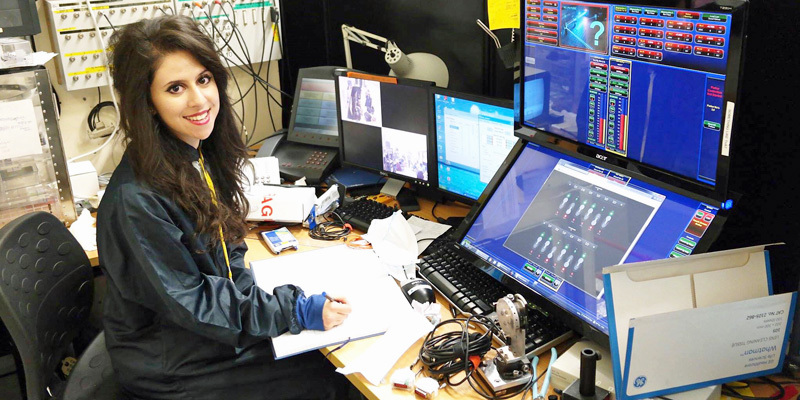 SLAC is based in Calfornia, and I spent a six-week summer placement there in the summer of 2016. I loved it so much that I wanted to continue working there, so I organised my M,Res, project to be based at SLAC and I cannot wait to go back! SLAC is a HUGE national lab in the US, which is home to the longest linear particle accelerator in the world! You can find out more about my previous adventure at SLAC here. But for now, I’m based at Imperial College in London and during my day, I not only do science in the lab and in lectures but I also do quite a lot of social media-ing. I’ll post lab selfies with a cool fact about the science of my experiment or something cool I’ve learnt that day. I love seeing what others do in the lab so I want to share what I do in the lab too so I can try and change the classic physicist stereotype of a man writing equations with chalk on a blackboard. I like to also film short Facebook LIVE videos and Instagram stories to give a glimpse of my physics world to my followers. On top of that, every other Saturday I produce a radio show called Science Mixtape, where we interview different scientists and learn more about their science lives, as well as their musical tastes! The show airs every other Saturday at 12pm on Soho Radio and we’re also a podcast too. Alongside my studies, I also write physics articles for Forbes, which I try and squeeze into my weekend. At the moment, I am preparing for my M.Res. project by reading lots of scientific papers relating to my project. After I’ve done some reading, I will need to write a literature review which summarises all the reading I’ve done. From here, I can start my project with some prior knowledge which will hopefully lead to a smooth start. It’s important to keep reading throughout your research as it keeps you up to date with your ever-changing field but also allows you the learn the science that is relevant to your work, helping you to progress with your work faster. Dependent on when my VISA gets issued, I’m hoping to leave for Stanford University in mid-February and I’ll be there until September working on LCLS-II. LCLS-II is the world’s first hard x-ray (free electron) laser. With this laser you can probe the very small on really short timescales. Scientists that work on LCLS-II have made mini science movies of biological reactions relating to photosynthesis and they can also recreate the conditions of space in the lab! My project will be related to characterising the laser pulse at LCLS and making sure it is optimised for best performance. To do this, I will be using a technique called TERMITES, which is what I am currently researching so that when I start to build my experimental setup I will know what to do. I can’t wait to get my hands on the equipment and start building and working with lasers! During my A-levels, I was the only girl in my class and I felt like such an outsider. A lot of my friends found it weird that I liked physics and it was seen as a ‘guy’ subject in my school. I got comments like: “You’re clever, you should do medicine instead” or “Why do you even like physics?”. But I stuck through it, and followed my passion no matter what anyone said. When I became one of the first women from my school to take physics onto higher education, I felt the need to go back to my old school and inspire the younger generation, particularly the girls, to get into physics. I wanted those girls to feel like physics was a subject that they could do and have fun too! As a result, I set up a science club at the school which I carried out alongside my physics degree during my first and second year. I caught the physics bug and I wanted others to catch it too! I also got recognised by the Institute of Physics for my science club work where I became a Very Early Career Physics Communicator Award finalist. Since then I’ve been on a mission to get the stories of women in physics out there, I started blogging and occasionally vlogging (video blogging on YouTube) to show others that physics is a subject for boys AND girls. I also take part in science events like the Royal Society Summer Science Exhibition (I’d definitely recommend going – it’s AMAZING!) and the Imperial Festival where I share the research work that I do with members of the public. As I mentioned before, I also write physics articles for Forbes and I’m a producer for the Science Mixtape radio show. For me, I’m already part of a minority, as I am a woman doing physics and on top of that I’m of African descent. At school, I always felt like an outsider for being the only girl in my physics class and then when I went to university I started to notice that not only were most of my lecturers male, but they were mostly white males. When people ask me these questions after I’ve given a talk I generally feel like they’re more interested in my background than my science and it’s the same when people comment on my appearance after a talk too. Or that I look “too glamorous” to be a scientist. It would have been nice if these questions or comments were related to my science. I think science is global and that anyone can do it. Without collaborations and sharing ideas we wouldn’t be able to progress as quickly in science. When people ask about my background, instead of shying away from it like I used to, I talk about my background with pride so that other BAME people can have a role model and see that science is for everyone, no matter where you’re from. 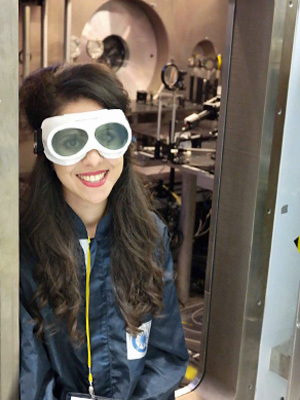 My advice to other BAME girls and women who are interested in science is: Just be you, follow your passion and dreams and don’t let anyone tell you that you can’t do something. If there’s one thing I’ve learnt about being a minority in a minority (or a minority squared!) is that I should speak up when I have a problem and that I should follow my heart and not let negative comments let me down. It is easier said than done though, and it’s taken me many years to get to a position where I am confident enough to speak out. Reach for the stars and beyond – you can do anything that you put your mind to. Soon, I’ll be off to sunny California to do my M.Res. project and hopefully have a working experiment. After my M.Res., it would be one of my dreams to do a joint Ph.D. between Imperial College and Stanford University. Ideally, I’ll be working with lasers and after that I’d love to become a laser engineer. It’s amazing how many things you can do with lasers – imaging and recreating the conditions of space in the lab!